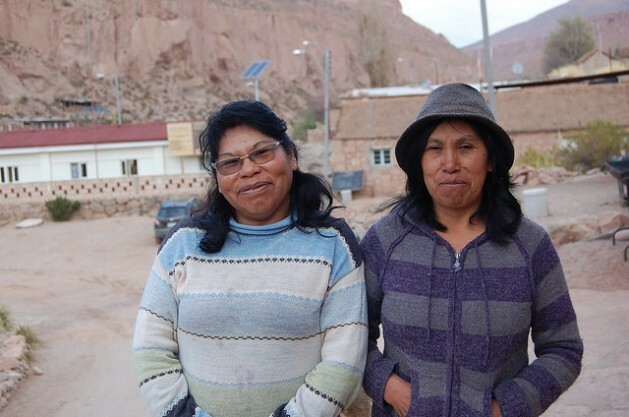 CASPANA, Chile , Sep 2 2015 (IPS) - Liliana and Luisa Terán, two indigenous women from northern Chile who travelled to India for training in installing solar panels, have not only changed their own future but that of Caspana, their remote village nestled in a stunning valley in the Atacama desert. Her cousin, Luisa, said that before they travelled to Asia, there were more than 200 people interested in solar energy in the village. But when they found out that it was Liliana and Luisa who would install and maintain the solar panels and batteries, the list of people plunged to 30. “In this village there is a council of elders that makes the decisions. It’s a group which I will never belong to,” said Luisa, with a sigh that reflected that her decision to never join them guarantees her freedom. Luisa, 43, practices sports and is a single mother of an adopted daughter. She has a small farm and is a craftswoman, making replicas of rock paintings. After graduating from secondary school in Calama, the capital of the municipality, 85 km from her village, she took several courses, including a few in pedagogy. Liliana, 45, is a married mother of four and a grandmother of four. She works on her family farm and cleans the village shelter. She also completed secondary school and has taken courses on tourism because she believes it is an activity complementary to agriculture that will help stanch the exodus of people from the village. But these soft-spoken indigenous women with skin weathered from the desert sun and a life of sacrifice are in charge of giving Caspana at least part of the energy autonomy that the village needs in order to survive. 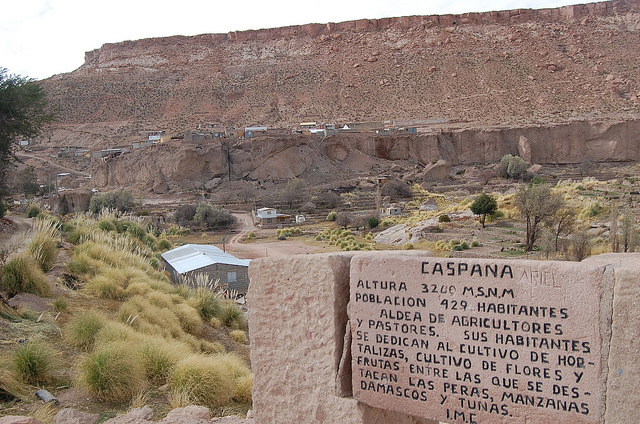 Caspana – meaning “children of the hollow” in the Kunza tongue, which disappeared in the late 19th century – is located 3,300 metres above sea level in the El Alto Loa valley. It officially has 400 inhabitants, although only 150 of them are here all week, while the others return on the weekends, Luisa explained. They belong to the Atacameño people, also known as Atacama, Kunza or Apatama, who today live in northern Chile and northwest Argentina. “Every year, around 10 families leave Caspana, mainly so their children can study or so that young people can get jobs,” she said. Up to 2013, the village only had one electric generator that gave each household two and a half hours of power in the evening. When the generator broke down, a frequent occurrence, the village went dark. Today the generator is only a back-up system for the 127 houses that have an autonomous supply of three hours a day of electricity, thanks to the solar panels installed by the two cousins. Each home has a 12 volt solar panel, a 12 volt battery, a four amp LED lamp, and an eight amp control box. The equipment was donated in March 2013 by the Italian company Enel Green Power. It was also responsible, along with the National Women’s Service (SERNAM) and the Energy Ministry’s regional office, for the training received by the two women at the Barefoot College in India. So far, 700 women from 49 countries of Asia, Africa and Latin America – as well as thousands of women from India – have taken the course to become “Barefoot solar engineers”. They are responsible for the installation, repair and maintenance of solar panels in their villages for a minimum of five years. Another task they assume is to open a rural electronics workshop, where they keep the spare parts they need and make repairs, and which operates as a mini power plant with a potential of 320 watts per hour. In March 2012 the two cousins travelled to the village of Tilonia in the northwest Indian state of Rajasthan, where the Barefoot College is located. They did not go alone. Travelling with them were Elena Achú and Elvira Urrelo, who belong to the Quechua indigenous community, and Nicolasa Yufla, an Aymara Indian. They all live in other villages of the Atacama desert, in the northern Chilean region of Antofagasta. “We saw an ad that said they were looking for women between the ages of 35 and 40 to receive training in India. I was really interested, but when they told me it was for six months, I hesitated. That was a long time to be away from my family!” Luisa said. Encouraged by her sister, who took care of her daughter, she decided to undertake the journey, but without telling anyone what she was going to do. The conditions they found in Tilonia were not what they had been led to expect, they said. They slept on thin mattresses on hard wooden beds, the bedrooms were full of bugs, they couldn’t heat water to wash themselves, and the food was completely different from what they were used to. “I knew what I was getting into, but it took me three months anyway to adapt, mainly to the food and the intense heat,” she said. Liliana said that when she got back to Chile her family welcomed her with an ‘asado’ (barbecue), ‘empanadas’ (meat and vegetable patties or pies) and ‘sopaipillas’ (fried pockets of dough). “But I only wanted to sit down and eat ‘cazuela’ (traditional stew made with meat, potatoes and pumpkin) and steak,” she said. On their return, they both began to implement what they had learned. Charging a small sum of 45 dollars, they installed the solar panel kit in homes in the village, which are made of stone with mud roofs. The community now pays them some 75 dollars each a month for maintenance, every two months, of the 127 panels that they have installed in the village. “Some of the batteries were bad, more than 10 of them, and we asked them to change them. But they said no, that that was the extent of their involvement in this,” she said. The company made them sign a document stating that their working agreement was completed. But, she said, there are people in this village who cannot afford to buy a solar kit, which means they will have to be donations. Despite the challenges, they say they are happy, that they now know they play an important role in the village. And they say that despite the difficulties, and the extreme poverty they saw in India, they would do it again. “I’m really satisfied and content, people appreciate us, they appreciate what we do,” said Liliana. “Many of the elders had to see the first panel installed before they were convinced that this worked, that it can help us and that it was worth it. And today you can see the results: there’s a waiting list,” she added. Luisa believes that she and her cousin have helped changed the way people see women in Caspana, because the “patriarchs” of the council of elders themselves have admitted that few men would have dared to travel so far to learn something to help the community. “We helped somewhat to boost respect for women,” she said. 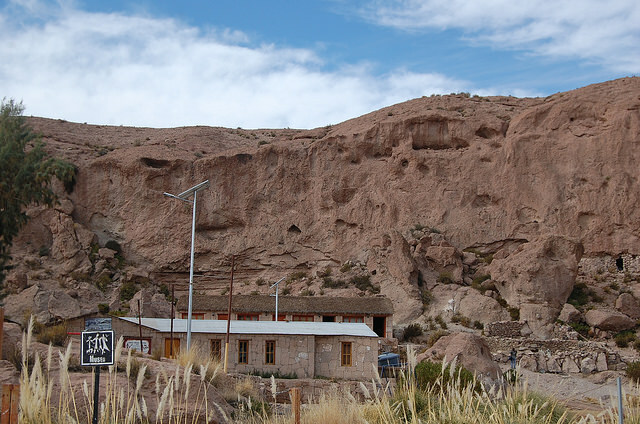 And after seeing their work, the local government of Calama, the municipality of which Caspana forms a part, responded to their request for support in installing solar panels to provide public lighting, and now the basic public services, such as the health post, have solar energy. “When I’m painting, sometimes a neighbour comes to sit with me. And after a while, they ask me about our trip. And I relive it, I tell them all about it. I know this experience will stay with me for the rest of my life,” said Luisa. Such great courage by these two women! We take what we have for granted here. Their personal sacrifices for their town deserve more recognition. I would like to go and help them. How can I get involved? Someone please contact me.